The United States Mint achieved record bullion program revenue of $3.47 billion for the fiscal year ending September 30, 2011, representing an increase of 21.57% compared to the prior year. The results were driven by a sharp increase in revenue generated from silver bullion coins, which offset a decline in revenue from gold bullion coins. The US Mint manufactures and issues bullion coins through a network of authorized purchasers. Current bullion programs include American Gold Eagles, American Silver Eagles, American Gold Buffalo coins, and America the Beautiful Silver coins. These coins are sold to authorized purchasers in bulk quantities based on the market price of the metal plus a premium. The authorized purchasers distribute the coins more broadly to the public and agree to maintain a two way market for the coins. The weight, content, and purity of all bullion coins are guaranteed by the United States government. This article continues coverage of the US Mint’s 2011 financial results. Although bullion product revenue achieved a record high for the fourth consecutive year, the rapid pace of growth seen in recent years has slowed. During the years 2008, 2009, and 2010, the US Mint had experienced annual revenue growth of 166.44%, 78.62%, and 68.48%, for each year respectively. For the 2011 fiscal year, revenue grew by 21.57%. Gross costs for the program, which are primarily made up of the cost of the precious metals, increased proportionally with revenue. The US Mint manages the bullion programs to a nominal net margin, which remained stable at 1.90%. During the 2011 fiscal year, the US Mint sold 22.7% fewer ounces of American Gold Eagles compared to the prior year. However, higher spot prices offset the decrease in volume, resulting in a revenue decline of only 1.25%. The revenue generated by sales of American Gold Buffalo coins declined by a more significant 57.11%. This decline was driven by a change in the product release schedule. The 2010 fiscal year included the sales for all 2009 and 2010-dated coins, whereas the 2011 fiscal year only included sales for 2011-dated coins. American Silver Eagle sales grew in volume and revenue, which more than doubled from the previous year. The United States Mint was able to expand production of the coins by minting coins and fulfilling orders at the San Francisco Mint. Previously, the West Point Mint had served as the sole producer of Silver Eagle bullion coins since 2001. The Mint also increased production volume by transitioning from chrome-plated sand-blasted dies to wire-brushed non-chrome plated dies. The new dies were easier to clean and had a longer die life. 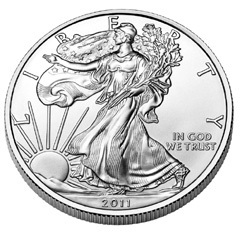 During the fiscal year, the US Mint introduced the America the Beautiful Five Ounce Silver Bullion Coins. The 2010-dated coins were offered in limited quantities in December 2010, with the first 2011-dated coins available in larger quantities from April 2011 onwards. The new program generated revenue of $110 million. American Platinum Eagles, which are not mandated by public law, were not produced or offered for sale during the fiscal year. You had touched on the impacts of changes in gold spot prices, but not silver. Pricing also influenced the dramatic change in Silver Eagle Bullion revenues, as we watched the yearly average of Spot Silver move from $20.20 / ounce in 2010 to $35.12 / ounc in 2011. $15 more per coin on top of the several million more bullion coins struck in 2011. Thanks, again, for all of your great work. I cannot wait to see what you have in store for us in 2012! !